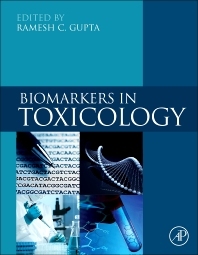 Biomarkers in Toxicology is a timely and comprehensive reference dedicated to all aspects of biomarkers that relate to chemical exposure and their effects on biological systems. This book includes both vertebrate and non-vertebrate species models for toxicological testing and development of biomarkers. Divided into several key sections, this reference volume contains chapters devoted to topics in molecular-cellular toxicology, as well as a look at the latest cutting-edge technologies used to detect biomarkers of exposure and effects. Each chapter also contains several references to the current literature and important resources for further reading. Given this comprehensive treatment, Biomarkers in Toxicology is an essential reference for all those interested in biomarkers across several scientific and biomedical fields. Why are biomarkers of dermal toxicity needed? Dr. Ramesh C. Gupta, Professor & Head of Toxicology Department at Murray State university, is engaged in experimental brain research in relation to Alzheimer’s disease (AD) and pesticide toxicity. He has delivered lectures in Australia, Italy, Japan, Germany, France, Switzerland, Spain, Czech Republic, China, South Korea, and Sweden. He served the panels of NIH, CDC, NIOSH, and NAS. He has >350 publications to his credit, including seven major books with Elsevier: (1) Toxicology of Organophosphate and Carbamate Compounds, (2) Veterinary Toxicology: Basic and Clinical Principles, (3) Handbook of Toxicology of Chemical Warfare Agents, (4) Anticholinesterase Pesticides: Metabolism, Neurotoxicity, and Epidemiology, (5) Reproductive and Developmental Toxicology, (6) Biomarkers in Toxicology and (7) Neutraceuticals. He is recipient of Murray State University's distinguished researcher award of the year-2006. He is a diplomate of American Board of Toxicology, and fellow of American College of Toxicology, American College of Nutrition, and Academy of Toxicological Sciences.